When choosing new tile for your floor, there are lots of products on the market. Beyond appearance there are other important features to think about like durability, ongoing maintenance, and regular cleaning. Marble and porcelain tile are two popular materials and both can be used in your next flooring project. In the sections below, we will explain the differences between them. 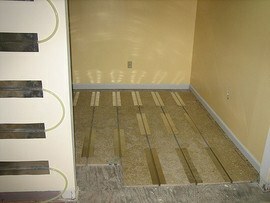 Any tiling project requires an assessment of the existing subfloor 1 and may require replacement or upgrading. In any floor installation project, the subfloor 1 must be clean, level, and sturdy enough to support the weight of the tile. Marble tiles can be fragile and difficult to match and therefore should be laid out on your floor before installation to make sure you are happy with the overall design. Experts suggest mixing tiles from different boxes to achieve a more balanced look. 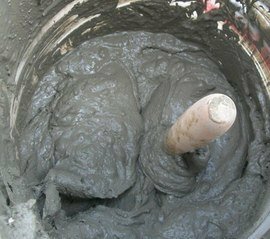 Porcelain tiles are heavy and require a special mortar 2, grout 3, and tools, which are different from those used for other ceramic tiles. 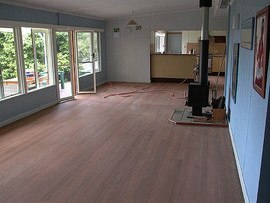 This can make the installation process very time consuming and increase the cost. Porcelain tiles cost on average between $3 and $5 per square foot for materials and between $5 and $10 per square foot for installation. Tiles cannot be installed directly onto a wooden subfloor 1 and may need cement backer boards installed at a cost of $4 to $7 per square foot. Expect average total costs to be between $8 and $15 dollars per square foot installed. Marble tile is typically more expensive and cost on average between $5 and $15 per square foot for materials and installation averages between $4 and $9 per square foot. These tiles are especially prone to breaking so plan to buy between 10%–20% more than needed. Expect average total costs to be between $9 and $24 dollars per square foot installed. 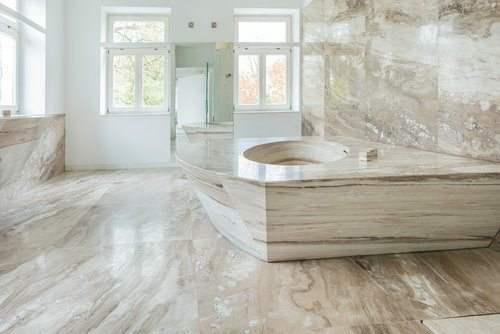 Marble is a natural stone product mined from quarries so each tile is unique in appearance. All tiles for your project should come from the same cut of stone in order to get the best match. Some white or light colored marbles can look translucent, making them a very attractive floor covering. Marble is well known for its use in high-end homes and buildings and can give a luxurious feel thanks to its smooth surface. Porcelain tiles are manufactured from clay and offer a wide variety of colors, textures, and patterns to choose from. 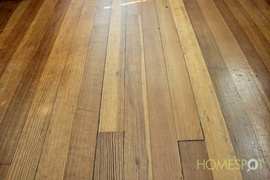 This allows porcelain tiles to have the look of natural stone or even hardwood but at a much lower price. Tiles can also be easily matched and even customized for your project. Marble tiles are not recommended for humid or wet areas like kitchens, bathrooms, or basements because marble will absorb moisture, which can lead to warping, dulling, and deterioration over time. Due to its polished finish, marble can be very slippery when wet. Porcelain tile is extremely durable making it an excellent choice for areas with lots of traffic. Grout 3 used in porcelain tile installations in bathrooms, kitchens, and other damp or humid areas will need to be sealed to prevent damage and mold growth because grout 3 can absorb moisture. With proper cleaning, maintenance, and regular sealing, marble tile will stand up to regular wear. 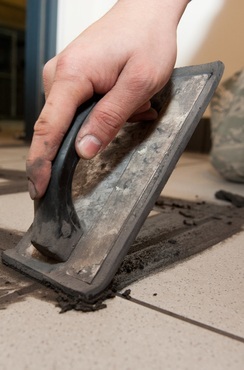 However, it is easily scratched, broken if something heavy is dropped on it, and spills require immediate clean up. Highly-polished marble surfaces require regular sanding 4 and polishing, often best done by a professional, in order to maintain their look. Porcelain tile is one of the most durable products available for flooring because it is hard, thick, and solid. It does not absorb moisture so it is ideal for high-traffic areas which may come in contact with water. Spills, however, should be cleaned up as soon as possible to prevent staining or damaging the grout 3. As long as the tile is undamaged, expect porcelain tile flooring to last the lifetime of your home. As marble is a natural stone product, it is porous, meaning it has tiny holes, requiring a surface sealant to prevent permanent stains. After the initial installation and sealing, it’s recommended that you reseal your marble tile every six to twelve months depending on how much foot traffic it gets. Mild acids found in the kitchen – like vinegar or lemon juice – can cause problems to the finish. Depending on the type of stain, specialized cleaning products may be necessary. Marble tile is also susceptible to chips, cracks, and breakage and can be scratched by vacuuming. Porcelain tile is manufactured from clay and fired in a kiln, making it very hard and durable. It is moisture- and stain-resistant and easy to clean. While the tiles are durable, the mortar 2 and grout 3 used for installation is more vulnerable to moisture and requires a surface sealant in order to prevent water absorption. If the grout 3 or mortar 2 does get wet, it can compromise the flooring or lead to the growth of mold. Marble tile floors can increase the resale value of a home, but only if they have been installed and maintained properly. 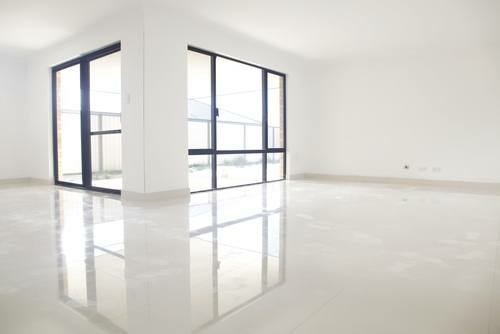 Porcelain tile floors don't have a big impact on resale value because they are lower cost and much more common. Both marble and porcelain tile flooring can be installed over radiant floors 5, which is a roll-out mat set in thin concrete before the tile is installed. How much does it cost to install marble or porcelain tile flooring in my city? Cost to install marble or porcelain tile flooring varies greatly by region (and even by zip code). To get free estimates from local contractors, please indicate yours.